Completed om 2003, this par 73 course is set to become one of the top inland courses in the country. This 7433 yards parkland course features all greens being constructed to USGA standards with water being a predominant feature. I traveled from London to Cardiff in June, 2003. I can't remember when I've been treated so nice and I've traveled thru out the world, playing golf courses. The staff, from the hotel to the golf shop made me feel very, very welcome. I would recommend this resort to anyone that enjoys golf and being treated like a welcomed guest. The golf courses were great. On Boxing Day I played my first round of golf on the Lake course in the Vale of Glamorgan Golf Club with my dear friend Owain Gruffudd Williams and his father Mr. Rhodri Williams, both members at the club. 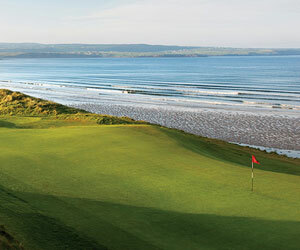 Some of the holes on the course were quite magnificent, so beautiful but yet so close to the Welsh City of Cardiff. It's so convenient just off the M4 it's wonderful. I'm honestly so glad that I've become a member of a golf club, Mountain Lakes up in the Caerphilly mountains, because now I have the opportunity to play great courses like the one I'm describing this very moment. It has been a pleasure commenting on the golf course. I'm relishing the challenge of playing this truly splendid course again. The course is set conveniently close to the M4 and the scenery is wonderful. Your round takes you from rivers and lakes into woods and hills. A deceptive par 3 start leaves you under no illusions that the course will be either easy or boring, with water waiting for you if you go through the green, and trees to block you out if you are too short. Despite several attempts I have still not managed a par on the stroke 1 par 4 fourth hole! The back nine again starts with a par 3 that is easy, providing you pick exactly the right club, and this part of the course is my personal favourite. From the par 3 to a straightaway par 4 then the signature hole, with the green surrounded by water. Each hole on this course is a delight in itself and the whole package of course and leisure centre is run in a totally professional manner, and I found a very warm welcome for visitors. I have no hesitation in recommending it as a course to visit and I have been back myself several times. I was so impressed with the course I organised a match for the Junior Section from my home club (Leighton Buzzard) against the junior section. We all agreed that, whatever ones standard of play it was an enjoyable visit, and we were made very welcome. I have recently become a member at The Vale and found myself playing on the most wonderful courses in the company of most wonderful people. Stunning.